We all know that there are some times when a piece of information is released to the media in a tongue-in-cheek fashion. Such as when a California immigration-activist satirically suggested that illegal immigrants should chose "self-deportation" ... only to have the presumptive presidential nominee for the Republican party bring up "self-deportation" in a debate as though it were really a possibility. Well, Chiclets - it appears that the same has happened regarding the news that VH1 is using their hit show Mob Wives as a basis for an opera. A fellow blogger - with whom we've had run-ins before - has taken a mole hill and turned it into an operatic mountain. 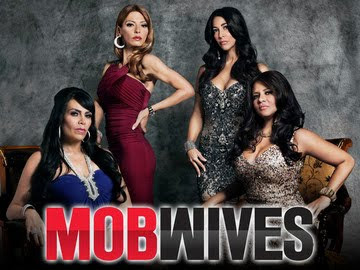 VH1 is not putting Mob Wives on the operatic stage, as was reported - at least not physically. Although, to be honest, if they wrote the role of Big Ang as a bass baritone - which, clearly ... they should - Yours Truly might actually consider dressing in drag to play the role. Big Ang is absolutely hysterical. Mob Wives can be dramatic, even operatic at times (although this season, you could also compare it to a Greek tragedy with all the familial betrayal). But all that intense emotion is why we love it so…and why we love this new promo which premiered on Sunday night. Watch the video above to see the Mob Wives Opera play out in all it’s bobble-headed glory. Unlike Big Ang, we think you should stick around for this drama. Mob Wives airs Sundays at 8 p.m. ET/PT. For Big Ang I see Bryn Terfel.